Because the quality of all school projects is measured against the excellence of the M. Scott production of "Threat Level Midnight." I will be first to admit that I was incredibly behind one of the biggest cultural trends of my generation. Unlike almost every college student in America, I had (until recently) never seen "The Office." Over Christmas break, however, my brother (who has watched the show multiple times) and my sister (who was seeing it for the first time) convinced me to watch some with them, mostly by making me feel extremely left out that I had no idea what they were talking about. So, with nothing new on TV to watch, I did what every good 20-something does over a month-long holiday: turn to Netflix. Needless to say, I watched the six-episode first season in one sitting. I was hooked. And horribly embarrassed that I had thus-far missed out on this cultural icon. But most of all, I was surprised at the applicability of the quotes of on Michael G. Scott. While he may be a painfully awkward character to watch, Michael Scott says some of the most relatable, and sometimes inspirational, things on the show. 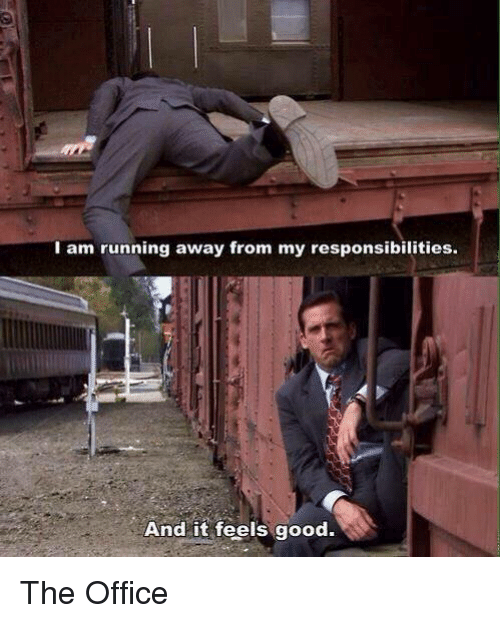 Here are 15 times that Michael Scott was perfectly relatable to all of us college students. 1. "Wikipedia is the best thing ever. Anyone in the world can write anything they want about any subject. So you know you are getting the best possible information." Let's be honest. Every student — regardless of age — has lazily looked up a fact on Wikipedia rather than actually look for verified information. So choose to take the Scott-perspective: everyone is helping you do your work, to the best of their ability so obviously, it's the best information out there. 2. "Sometimes I'll start a sentence and not even know where it's going. I just hope I find it along the way." This is the way that most college essays are written. Especially scholarship applications, reflection essays, and self-evaluations. 3. "I don't hate it. I just don't like it at all and it's terrible." This is applicable in so many cases. Dining hall food. Homework. Dorm rooms. Group projects. Exams. Labs. Pick your poison. 4. "I'm not superstitious but I am a little-stitious." It's not superstitious to wear the same jersey to every school basketball game until March Madness. It's not insane to use the same pencil for every exam. Or to have a lucky interview outfit. Right? 5. "I love inside jokes. I'd love to be part of one someday." For that time when the professor assigns groups for a project, and you get stuck with the pair of people that have been besties since freshman year. 6. "I would not miss it for the world. But if something else came up I would definitely not go." So your theater friend (maybe even just acquaintance?) invited you to their one-person show, and you've already mentioned that you don't have any homework tonight. Does having to clean your car count as something coming up? I guess if you don't have a car, you're going to that play. 7. "Oh God. My mind is going a mile an hour." When studying, we all reach this peak moment of mental speed where our brains cannot possibly fathom any more information. There is no higher speed of thought. 8. "Do you think that doing alcohol is cool?" Catchphrase of the mom-friend of your friend group. This is how I pay off my student loans right? I just yell that several times? 10. "And I know exactly what to do. But in a much more real sense, I had no idea what to do." I thought I was going to know what I was doing by the time I was in college. I would pick a major then get a job. Turns out there's a lot in the middle no one warns you about. You think you have a life plan: think again. What's that stat they tell you: all students change their major at least once? Everyone changes careers more than once? So basically, that's code for no one knows what's going on at all. 11. "Why don't you explain this to me like I'm five." The question we all want to ask the professor at least once in the semester. 12. "I'm running away from my responsibilities. And it feels good." Do you have an exam on Monday. Great! That means it's time to go on a spontaneous trip to a theme park. Or maybe re-watch "The Office"! The key to every last-minute presentation. Have nothing to say? It doesn't matter, most people are looking at the images anyway. Or just a fun comment while pointing at others. 14. "The only thing that could make this day better is ice cream." There is no exam failure, breakup, or lost job-offer that a gigantic tub of ice cream cannot at least begin to fix. 15. "Point is, don't listen to your critics. Listen to your fans." On an oddly inspirational note (and pieced in after a long analysis of "Antz" and "Bug's Life") Michael drops this little gem of wisdom. Surround yourself with people that love the you that you are and support your dreams, not people who want to change you with their negativity. And you can always dance off any negativity with the Scarn Shuffle.